Breakfast at the hotel. Depart for a tour of India's capital. 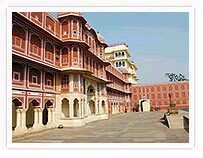 Sightseeing of Old Delhi includes a visit to the Red Fort, built in 1648 during the reign of Shah Jehan in red sandstone, which gave the fort its name. Jama Masjid is India's largest mosque, built of red sandstone and white marble in the middle of the 17th century. Chandni Chowk (Silver Street), once the imperial avenue down which Shah Jehan rode at the head of lavish cavalcades, is today bustling with shops, stalls and silversmiths' ateliers. Also visit Raj Ghat where Mahatma Gandhi was cremated, Shakti Sthal, the cremation spot of Indira Gandhi and Veer Bhumi, memorial to Rajiv Gandhi. 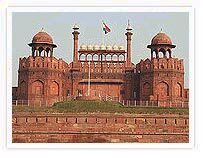 Sightseeing of New Delhi includes a visit to India Gate, built in memory of Indian soldiers killed during the First World War. Rashtrapati Bhawan, built in the early 20th century as the Imperial residence of the Viceroy is today the official residence of the President of India and Parliament House, an unique circular building with huge colonnades, houses the Upper and Lower Houses of Parliament. Lakshmi Narayan Temple was built in 1938 in a pleasantly laid out garden and is named after the goddess of wealth and the god Narayan, though other deities are also housed here. Humayun's Tomb is the first Mughal garden tomb. Visitors are immediately struck by the tomb's resemblance to its more famous cousin - the Taj Mahal - with its four grand gateways, octagonal base-plan, soaring niche-shaped arches, lofty double domes and the symmetrical garden with its central canal. After breakfast depart on the 5 hours drive to Jaipur. Just before entering Jaipur, visit Amber, the capital for 6 centuries before Jaipur was built, which lies 11 km north of Jaipur. Rising majestically on the slopes of a hill, this 11th century fort and palace complex is a blend of Hindu and Muslim styles - the earlier constructions in the inner apartments designed by the Hindu founder are austere, while later constructions abound in the rich flourishes characteristic of Muslim influence. The Diwani-i-Am (Hall of Public Audience) affords a view of the strategic location of Amber. The Jai Mandir (Hall of Victory) is the finest example of the artistic exuberance of the day - panels of alabaster, fine inlay work, a shimmering Hall of Mirrors, renowned for its fine mirrorwork. The Sukh Nivas (Hall of Pleasure) has 17th century air conditioning. Elephants carry you up the ramparts of the fort. On arrival in Jaipur check in at your hotel for overnight stay. After breakfast explore Jaipur, one of the best planned cities in India, built of rose-pink sandstone by the great astronomer-king Jai Singh II in 1727. The City Palace which stands in the centre of the city. Part of it is still the Maharaja's residence, while most of the complex has been developed into a museum containing rare manuscripts, fine specimens of Rajput and Mughal paintings, royal apparel and an armoury. Hawa Mahal (Palace of Winds) is the landmark of Jaipur. It stands on one of the main streets, a curious building, elaborate and fanciful, built of pink sandstone with a delicate honeycomb design. Rising five storeys high, it is composed of semi-octagonal overhanging windows, each with its perforated screen, which allowed the ladies of the court to look onto the main street without being seen. Jantar Mantar observatory was built by the founder of Jaipur, Maharaja Sawai Jai Singh. The huge stone instruments were devised to study the movements of the sun, moon and planets and are incredibly accurate. The afternoon is at leisure. There is time to wander through the colourful bazaars, a veritable collector's paradise where you can watch ancient craft forms - Meenakari jewellery consists of enameling delicate patterns of birds and flowers fired in glowing red, deep green, peacock blue and white; the gold jewel is then given further sparkle with emeralds, rubies, white sapphires and dangling pearls. In tiny ateliers you can see the age-old tie-dye methods of cloth printing, with meter upon meter of vivid turquoise, ochre, peacock blue, parrot green and crimson cloth unfolding. After breakfast depart on the 6-hour drive to Agra. En route visit Fatehpur Sikri, the deserted sandstone city, which was the glorious but short-lived imperial capital of Akbar, the greatest of Mughal emperors. Lying on a rocky ridge, it is today a haunting complex of empty palaces, forts and mosques. A variety of architectural styles are found, since craftsmen representing many schools were employed. On arrival in Agra check in at Hotel. Afternoon depart for a tour of Agra. Visit the red sandstone Agra Fort, which stands like a crescent on the banks of the Jamuna river, enclosed by forbidding 20-meter high walls, with a 12-meter moat between them. Three successive Mughal emperors - Akbar, Jehangir and Shah Jehan - helped create this massive structure which contains Hindu and Muslim architecture. The Tomb of Itmad-ud-Daulah is a mausoleum on the left bank of the Jamuna, built by empress Nur Jehan in memory of her father. Though small, it is perfectly proportioned and regarded as the forerunner to the Taj Mahal, being the first Mughal building all in white marble. The highlight of your trip will probably be a visit to the Taj Mahal, surely the greatest monument to love and one of the wonders of the modern world. Completed in 1652, skilled craftsmen from Persia, Turkey, France and Italy and some 20,000 labourers worked for 17 years to build this edifice, constructed by emperor Shah Jehan as a mausoleum for his beloved queen Mumtaz Mahal. Continue on the 4-hour drive to Delhi. On arrival check in at The Connaught for overnight stay. Have breakfast on early morning and drive to Delhi for approx 4 hours in time to board your flight for Kathmandu departs in the afternoon. Arrive Kathmandu from Delhi & You are met outside the International Arrivals Hall and transferred to Hotel. 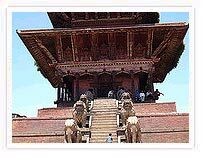 In the morning, take a tour of Kathmandu city visiting the Durbar Square, Hanuman Dhoka, House of the Living Goddess, Kasthamandap and other fascinating temples in the area. Move on to Swayambhunath , the oldest Buddhist shrine in the world also known as the `Monkey Temple'. Perched high on a hilltop, it commands a superb view of the entire Kathmandu Valley. In the afternoon visit Patan, the city of architecture and fine arts, founded in 250 AD. It is renowned for its fine works in bronze, silver and copper. Visit the Durbar Square, the Royal Baths, Mahaboudha temple, Krishna Mandir and Hiranya Mahavir - the Golden Temple. Also visit the Tibetan Handicraft Centre at Jawalakhel where you can watch the art of carpet weaving. In the morning visit Pashupatinath, the most sacred of all Hindu temples in Nepal is situated on the banks of the holy Bagmati River. Non Hindus are not allowed to enter the temple precincts but may look into premises from the opposite bank. It draws tens of thousands of pilgrims and devotees from Nepal and India during the festival of Mahashivaratri (the night of Lord Shiva). Also visit Bodnath, possibly the world's largest Buddhist stupa and a site of great veneration for Buddhists. Around the stupa have sprung up a number of monasteries of the different sects of Tibetan Buddhism including one (on the west side of the stupa) that houses an enormous seated statue of Maitreya Buddha splendidly adorned. In the afternoon visit Bhatkapur, home of medieval art and architecture, also known as the "City of Devotees". Places of interest include the Lion Gate, the Picture Gallery, the Golden Gate and the Palace of Fifty-Five Windows. Also stop at the little village of Thimi where colourful papier-mâché masks and terra-cotta items are made. Depart Kathmandu early morning for a two and a half hour drive to the raft put-in point ( Optional). After the crew has assembled the raft and explained the use of safety equipment, set off down river. The first day is a leisurely introduction to river life. Encounter several rapids including one rated difficult. Spend the day pursuing a variety of interests: photography, fishing, birdwatching and hiking. A picnic lunch is served on one of the sandy beaches. One of the most satisfying aspects of a river trip is the unhurried tempo. The pace is determined by the enthusiasm of the group/ individuals. New and interesting scenes present themselves at each bend in the river. 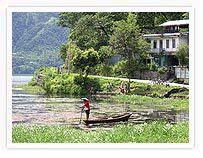 Travelling by raft is a perfect way to view the luxuriant vegetation which is a remnant of the vast forests which once covered the middle hills of Nepal. Vehiclesawait you at the put-out point for the drive to Pokhara. Wake up early in the morning to watch the sun's rays bathing the pristine snow-clad peaks in shades of yellow, orange, flame and gold. You get spectacular views of some of the giants of the Western Himalaya - Annapurna, Himalchuli and Machhapuchhare (the Fishtail Peak). Spend the day relaxing at the hotel or exploring this quaint little town. After breakfast depart on the drive through the middle hills to the Roayl Chitwan National Park. arrival you are met and transferred to your resort / hotel. Activities from the Resort include wildlife viewing from elephant back or Land Rovers, nature walks, jungle treks, birdwatching, boat trips and a slide or film show in the evening. All excursions are accompanied by one of our resident naturalists. Wildlife in the Royal Chitwan National Park includes the Great Indian one-horned Rhinoceros, spotted deer, hog deer, Sambar and barking deer as well as a wide variety of birdlife - some 450 species have been recorded. There is also a chance of spotting the leopard, sloth bear, gaur and tiger. Overnight at your resort / hotel. Morning and afternoon wildlife game drive. Overnight enjoy the slide show and other activities in your resort / hotel. Late morning transfer to Meghauly airport for the 30-minute flight to Kathmandu. Or you may drive back to Kathmandu. You are met on arrival and transferred to the delightful little hill town of Dhulikhel. Wake up early in the morning to see the spectacular sunrise over the eastern Himalayas. There is time to relax at the resort or take a walk in the surrounding hills. After lunch drive back to Hotel for overnight stay. Transfer to the airport for the flight to Delhi or Mumbai.